Line a 9 x 13 inch rectangle jelly roll / shallow pan with non-stick baking paper. The edges of the paper should be sticking out of the pan. Sift the flour, corn starch and baking powder together in a medium bowl. In a large bowl, whisk the egg yolks, 40 g of caster sugar, oil, milk and vanilla extract until pale yellow and thickened. Fold in the dry ingredients gently until there are no lumps and set aside. Using a stand mixer or handheld mixer, whisk the egg whites until soft peaks. Add in remaining 40 g sugar and whisk until stiff peaks. Fold ⅓ of the egg white meringue into the egg mixture gently. It is okay to see streaks of egg white at this point. Repeat with the rest of the meringue. The batter should look like and airy. Tap the bowl gently to release large bubbles and pour the batter into the prepared pan. Place the pan onto a large baking tray and pour a cup of water into the baking tray so that the pan is sitting in a water bath. Bake for 15 mins or until a skewer inserted comes out clean. Meanwhile prepare the filling by whisking the cold whipping cream with the powdered sugar until stiff peaks. You could use a handheld mixer for this. Cover and chill in the fridge until ready to use. Remove the cake from the oven and allow to cool for 10 mins on a cooling rack. Flip the cake over onto another sheet of non-stick baking paper and slowly peel of the baking paper on the cake. Score a line along the sponge with a knife, careful not to cut all the way into the cake. Roll the cake together with the baking paper into a log. Let it cool for another 15 mins before unrolling it. When the cake is still warm but not hot enough to melt the cream, spread an even layer of the cold whipping cream leaving about 4-inch gap at the furthest end. 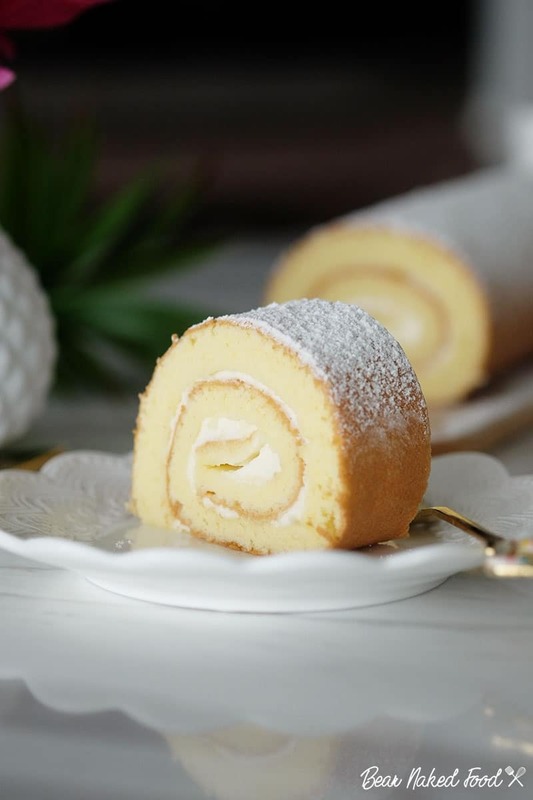 Roll the cake into a log and place the opening seam down. Dust generously with powdered sugar and serve. The cake keeps well in the fridge for up to a week.